Report predicts Australia’s installed battery capacity will grow 50-fold within 10 years, with half of all households to have battery storage, and many using their solar arrays to charge their electric vehicles. The amount of battery storage capacity installed in Australia will grow 50-fold over the next 10 years, a new report has predicted, and the rapidly falling costs of the technology will make electric cars competitive with conventional cars within the next 20 years. The report, published on Tuesday by the Climate Council, predicts that half of all households in Australia will soon have solar with battery storage, with the market potentially growing to $24 billion. Globally, the market for solar PV panels and battery storage is expected to grow tenfold in less than five years. Currently, according to AEMO, there are about 500 residential battery storage and solar power systems installed across Australia, while large-scale battery storage capacity is around 0.5 GW. But like international energy storage market leaders Enphase (US) and SolarEdge (Israel), the Climate Council report – Powerful Potential: Battery Storage for Renewable Energy and Electric Cars – predicts Australia will be a key market for battery adoption, thanks to a combination of high-cost electricity, high solar uptake and solar feed-in tariffs that make self-consumption a priority. And it’s just the latest report to do so. Another, published in September by energy research group Energeia, predicted demand for battery storage would be booming by 2025, when Australian households and businesses would be installing battery systems at a rate of 55,000 a year. Even federal environment minister Greg Hunt, whose Coalition government recently announced it wanted to accelerate the rollout of energy storage technology in Australia, said this month that batteries were “clearly the future,” for Australian households, and would inevitably help take large numbers of them off grid. Interestingly, however, the Climate Council report also notes that battery storage technology has the potential to reduce the two biggest contributors to Australia’s rising electricity bills – and thus, perhaps, the motivation for households to go off-grid – which are costly network upgrades and wholesale energy costs. For households, meanwhile, a battery storage system as small as 4kWh in capacity would boost the amount of solar self-consumption from between 30 and to 60 per cent. And while battery costs continue to slide – between 2007 and 2014 they have fallen by an average of 14 per cent a year – the report says adopting storage will cost households around $10,000 a system, with a payback of 10 years. Falling battery costs would also accelerate the uptake of electric vehicles, says the report, effectively removing the key barrier blocking their uptake. “When battery prices reach $US150/kWh then battery electric vehicles will become directly cost competitive with conventional cars,” says the report. The report notes that electric vehicle uptake will benefit households by cutting their transport costs, as well as by providing a form of back-up household battery storage. “These households will be able to use their car’s battery to store excess solar power at peak times for use later – maximising their use of solar PV generation if they have a rooftop system – or to manage their electricity demand from the grid,” it says. I would not call Enphase and solaredge international energy storage leaders. To the best of my knowledge Enphase has not released their energy storage system to market yet. There are dozens of Australian companies that I would rate far higher with demonstrated ability to provide energy storage/power supply solutions. Like Aussie-made Selectronic… 🙂 BTW: I own one of theirs — very good gear indeed. I do have a vested interest as I sell this sort of gear so I try not to mention brands on this site. The company you mentioned have only been specializing in off grid inverters since 1985. Just a little annoying that the author of the article mentions brands as leaders when in actual fact they are the new untested kids on the block. Spending on residential batteries (and solar) is one of those personal goods which makes sense at the micro-economic (personal) level but is a waste of scarce money at the macro-economic (regional/state/national) level as large systems can be built and integrated into the supply system more cheaply and efficiently than multiple small systems. Look at the Nyngan, Moree and Broken Hill Projects where a small team of engineers/installers/sales built the equivalent of tens of thousands of residential systems quickly and with little fuss. Can Reneweconomy do an article or series on what moves are needed to maximise personal and national returns from investments in renewable energy/ energy efficiency/ building efficiency/energy exports? In particular I’d be interested to hear what noises the reformed Greg Hunt is making about pushing the renewable energy and storage sectors, and any concrete evidence that he is making moves on the policy ground, and what push back is coming from state and private generators, networks and distributors to prevent current systems being devalued as new energy systems come in. The value of residential solar and storage is not so much,to the average person, savings on the electricity bill, but is the ability to give the networks and utilities a big renewable kick up the pants. This is like a Christmas present, not very economical, maybe not even wanted but definitely worth the money spent. Utility scale solar is just peachy as you say but it is more of the same problem as domestic solar. A previous article shows the lovely large scale solar electricity being produced but it is still the unfortunate bell curve showing massive amounts of power being produced in the middle of the day, but none at night. The networks complain that domestic solar is skewing the electricity supply and then they go and build their own solar, presumably making the intermittency problem worse. They then promptly impose extra fees on domestic solar. If your enemy can make guns cheaper than yourself do you then disarm? Make no mistake, energy supply and distribution in Australia is a battle ground with many different agendas and alliances. Ultimately the aim is to decarbonise our economy – that means switching off the FF generators. The foot soldiers in this fight have been the mom’s and dad’s installing rooftop systems. Do we now, as a country, abandon them, like our troops at Gallipoli, or do we support them in the next phase of the renewables revolution, namely installing storage? Well said… a ‘battleground’ where we subsidise business and penalise people if they want to make a profit. This world is so wrong. Dismantle the social system, and put everybody on subscriptions for everything… no money and you have nothing… you can’t even keep a land you own. If your own solar panels plus battery make you happy, give yourself that Christmas present. No problem. If you also want to stay on the grid, pay for it. No problem. If the grid doesn’t ream you, no problem. How about using the “massive amounts of power being produced in the middle of the day” to pump water (where available) up to tanks/dams which can then be used to generate hydro. Exactisimo, pumped storage. Brisbane has the splityard creek dam at lake Wivenhoe it can store 500 MWH of energy. My point was not the lack of technology to dispose of all this solar power but the double standards applied. Households are evil daytime solar power producers mucking up the electricity supply network on the one hand and utility solar projects are wonderful examples of good corporate citizenship! 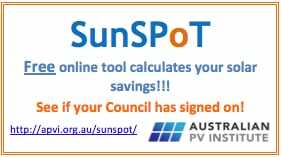 Don’t allow another selfish household solar installation, but flood the market with utility solar on farmland or way out in the outback. If you want to support utility renewables, support ones complimentary to distributed solar: pumped hydro as mentioned, wind, geothermal, solar thermal with storage, wave , tide, large scale flow batteries. There are some nice pumped storage projects like the Kidson and the Oven Mountain pumped hydro that are deserving public support not these foreign owned fields of solar panels. Call me paranoid, but I think that utility solar is just a way of trying to muscle out the little guy. But, then again, it’s all good. At least renewables are being planted no matter what. Or do “they” install (their own) storage. I think so. It will be a case of recent history repeating itself as we ride the downward spiral of battery costs just as we did with PV. Correct for the first part… the issue is — and is often forgotten — corporations will pocket the profits of the technological advancements. It will only be done, if it fills the private koffers; and not to let ‘people’ reduce their cost. You will see (and I bet on it) electricity will not become cheaper; despite the savings achieved in large scale new technologies. Some houses have too many trees to make solar PV viable. And some live in apartments. Maybe the grid could survive by cutting prices but they have not cut prices yet. Just for curiosity: which share of Australia’s expacted final energy consumption in 2025 will be delivered by these solar and battery systems? A Dorothy Dixer, but storage should alleviate to some degree the mid day trough and the 6pm peak. The demand will be more consistent through most of the day, except off peak and the 8am-9am minor peak. Gas as the most expensive will find it most difficult to enter the market, and hydro will enter the market before gas (as it does today). So in the short term gas will suffer as storage increases. Nevertheless, it will become very clear by 2025 that in Victoria we can reliably remove the second brown coal power station through the effects of explicit emissions legislation/regulation. Gas will continue to have only a small role. It will be interesting to see if electric vehicles will be charged in the early hours of the day, or during the middle of the day – at home vs at work scenarios. Maybe you know the answer, at least for Victoria, but I am curious. Let’s hope the EV’s will be charged during the middle of the day. If half of Australia’s houses have ~3.5kW PV, then they would generate about 23 TWh (83 PJ) of electricity. This is just under 10% of Australia’s electricity demand. It would only be about 1.4% of Australia’s energy consumption. However, this PV generation is likely to displace coal and gas generation, and also petrol consumption if it is used by EVs. Since most of these forms of fossil burning are only ~20%-40% efficient, then this 83 PJ of PV generation could displace the equivalent of something in the order of 300 PJ of fossil energy, resulting in a 4% reduction in Australia’s energy demand. ie, ~5% of Australia’s (dirty) energy consumption would be replaced by ~1.4% of cleaner energy. This calculation gives the (wrong ?) impression that 100/5 = 20 * 23 = 460 TWh clean electricity (or about 300 GW PV) would be enough to replace all of Australia’s (dirty) energy consumption? I certainly didn’t mean to imply that clean electricity could displace all of Australia’s energy needs with a factor greater than 3 improvement in efficiency. In the short to medium term, clean electricity is likely to displace coal & gas generation, petrol consumption and also gas heating. For all of these except gas heating, it is replacing 20-40% efficient processes. For gas heating, if it is replaced by reverse cycle air-conditioners with > 400% efficiency, then again you have a factor of 4+ increase in efficiency in moving to clean electricity. However other fossil energy uses in our economy, that clean electricity is unlikely to displace (atleast in the short to medium term), may be much more efficient, or difficult to replace with a 3+ fold improvement of efficiency. ie, coking coal in steel production. Add up the avoided services and a major engine maintenance (timing belt) over the battery life and the battery is signifiantly cheaper than the ICE maintenance costs and the removed EV battery is still perfectly serviceable as a stationary battery, so the new battery cost is further offset, making it a lot better value than the ICE alternative. Now watch the show as the electrickery market becomes ever more distorted by the market operators avoiding the truth and exponentially compounding their bad decisions. I don’t think the 200 mile EVs are going to help us much in Australia, or at least as long as the US $7,500 tax incentive lasts. That tax incentive is driving higher cost vehicles with more features and capability, rather than low cost vehicles for more people. A $37,500 US Bolt, Model 3 will be awfully expensive in Australia – more than the Volt was priced and the initial Leaf price. There are just not many (any?) EVs in development with the intention of massive production volumes so that they can be priced around say $20k in the US and $30k in Australia. I say this as an addicted EV owner who struggles to understand why the Leaf is not selling well in sectors that travel lots of kms – the business case is good. A DC fast charger does not cost a lot for a fleet to use. Right now, the battery is about a third of the vehicle price. This is about $10K for the Bolt and Model 3. When the batteries drop to $6K, we will see the $20K vehicles. When people see the battery electric vehicle with a lower cost up front, the demand will explode.